The header photo on this website of the Saginaw County Poor Farm, (as it was locally known- circa 1950's) was donated to the Saginaw Genealogical Society by a former County Farm Superintendents daughter, Joyce Marti Richter, who now lives in Florida. When the photo was brought back to Michigan, it became part of the Castle Museum's permanent collection and it is by courtesy of the museum that it appears on our site. These buildings are often referred to by the general public, as the Poor Farm. However, when looked at through the eyes of those who used to live there, it was never called that. At a recent visit by SGS board member Betty Coleman, and while on her various travels as she globe-trots, she met up with Joyce Marti, the daughter of the last manager of the Saginaw Community Farm, Walter Marti. Joyce gave us a photo of the county farm, it shows the farm and some of the cottages. Joyce relates some of her memories of the Farm. “Dad designed and invented a patient lift to get residents in and out of the bath tub. He didn’t patent his idea ~ it was very similar to what they use today. Of course the one he designed was manual, and not powered.” Joyce was sure her dad would have made a lot of money if he had put a patent on his design. But instead the purpose it was created for was not to make money but to help those in the home. Joyce talked about how the farm was where homeless people would go today. The purpose of the home was to offer shelter and help to those out who were either temporarily or permanently without a home, due to illness, loss of work, or the incapacity to provide for themselves. She has very fond memories living there as a child and as a young woman. She said, “I live liked a little rich girl. We had our meals cooked by the staff, cleaning done, and very nice private living quarters ~ it all came with my parents and grandparents being employed at the County Farm.” She has never talked about her parents being on call 24 hours a day. This seems like this could have been very stressful. In January 1892 the County Farm opened. In 1978 the infirmary was torn down and the residents were moved to the new Community Village across the street. The County Farm served the county for 86 year. Joyce’s grandparent and parents were in charge of the county home for 44 years. Some of the residents that were buried on Hospital Road in the Poor Farm Cemetery were moved to St. Andrews Cemetery. Others were moved to Oakwood Cemetery. 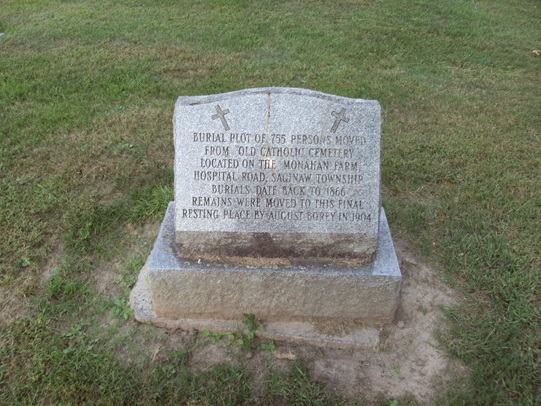 This is the marker in Section T commemorating their reburial. If you want to see the records of those who were moved to Oakwood cemetery please click HERE .